The effect of tellurium impurities on the electrical conductivity (σ), Seebeck coefficient (α), and Hall coefficient R of extruded Bi85Sb15 + 0.001 аt.% Pb is studied in the temperature range 77–300 K. It is found that doping with tellurium impurities up to 0.001 at. 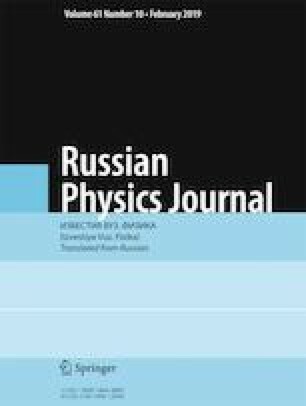 % compensating acceptor Pb atoms leads to a strong decrease in the electron density and, consequently, to an increase in σ and significant decrease in the values of α and R. The materials obtained can be used as the n-branch of thermoelements operating at temperatures of ~77 K.
Translated from Izvestiya Vysshikh Uchebnykh Zavedenii, Fizika, No. 11, pp. 170–173, November, 2018.